Tap this page for SMEDA Jobs 2018 Small and Medium Enterprises Development Authority. SMEDA is a statutory body responsible for the growth and development of small and medium enterprises, its head office is in Lahore, regional offices are in Lahore, Karachi, Quetta, Peshawar and Regional Business Centers in major business cities of Pakistan. 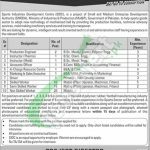 Today applications are invited to fill the following vacant posts at SMEDA which is going to recruit vacancies for Sports Industries Development Centre (SIDC) which is a project of SMEDA and the positions are (Production Engineer, Instructor (Thermo), Instructor (Mold), Accounts Officer, In-Charge Resource Centre, Marketing & Sales Executive, Driver, Skilled Worker, Semi-Skilled Worker, Non Skilled Worker). These positions are on contract basis which is extendable on satisfactory performance of an individual. Candidates wanted to apply for these jobs should hold qualification B.Com/BBA/BSc Engineering/Matric/Middle in relevant discipline as per the demand of vacant posts. So, only eligible candidates should apply as per the following how to apply procedure given below. Candidates are invited to apply by submitting detailed CV along with a recent passport photograph and attested copies of the educational certificate at the address mention below. Please mark the envelope with the position applied for. The last date for submission of application is April 21, 2018. Last Date to Apply: April 21, 2018. Address: Project Director, Sports Industries Development Centre (SIDC), 14-km Motra, Adjacent to Imam Bukhari University, Sialkot Road, Daska.